We are at 3800 north, 800 west. 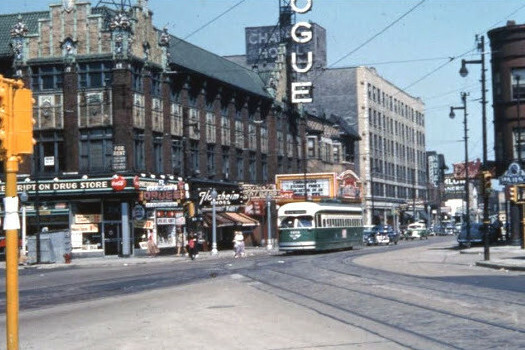 The 1955 photo features the Vogue Theatre. Once a vaudeville house known as the Chateau, the building also had offices, a bowling alley/billiard parlor, a ballroom, and a garage. And on the right side of that 1955 photo, notice the two street lights—the reflective glass enveloping the incandescent bulb was considered state-of-the-art then. Today the Vogue Theatre building has been replaced by a high-rise apartment. Behind it, other old buildings have been cleared to make way for Gill Park. 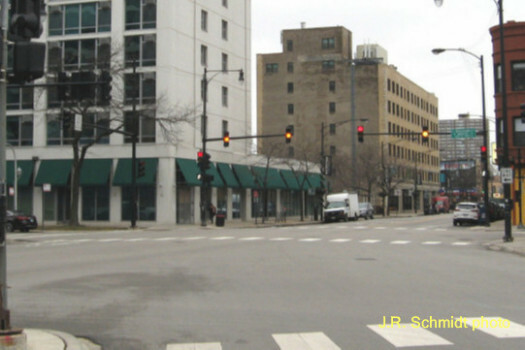 And though the 1955-model street lights are gone, other retro styles of street lights are popping up all over the city.